Other Distinguishing Features: Rockpile is a cybernetic battle-suit which contains a small pilot. Its body consists of a mechanical rock substance. 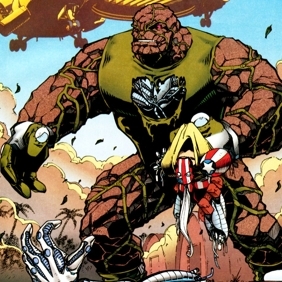 NOTE: Rockpile created by Erik Larsen, with help from Keith Giffen and Dave Johnson. When the United States Government decided to send SuperPatriot on a strike against the Covenant of the Sword, Rockpile defended the targeted facility. He defeated the hero and turned him over to his superiors for brain-washing. When SuperPatriot was augmented with the Covenant’s technology, he was then turned on the loose on the same facility. This time he succeeded in eliminating the base, killing Rockpile in the process.